The victory of Brexit in the United Kingdom’s European Union membership referendum and the election of Donald Trump in the 2016 United States Presidential elections spread the use of the term “post-truth” politics. The expression is used to characterize the circumstances in which objective facts are less influential in shaping public opinion than appeals to emotion and personal beliefs. Beyond its recent popularity, the idea that technical arguments are less efficient at convincing voters than stories with emotional ties had already been proposed in studies on issues as diverse as the attitudes towards immigration (Katwala, Ballinger, & Rhodes, 2015) or the inheritance tax (Graetz & Shapiro, 2005). However, the support sustaining this claim is based mostly on anecdotal evidence and no proper test identifying the extent to which voters are indeed more influenced by emotions and personal belief than facts has been developed yet. 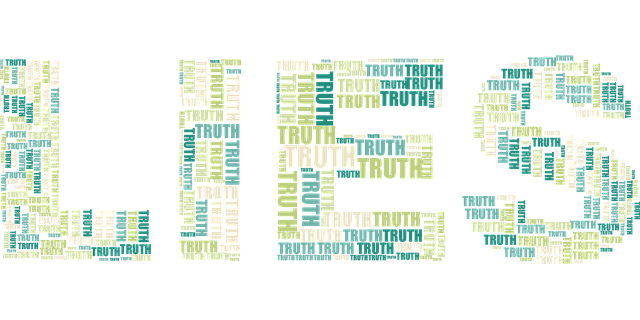 We have conducted an online survey experiment in Spain to test if post-truth is indeed a phenomenon. In the experiment, we asked all respondents to specify their level of agreement or disagreement on a scale from 0 to 10 for raising tuition fees in universities in order to increase the number of nursery places for kids between 0 and 3 years old, a policy they were told would be a more efficient way of spending the resources. The policy at stake was one that has not been politicised by parties or any other influential group in the Spanish political debate. Hence, respondents were expected to have few preconceptions, allowing for any new information to have strong effects. While the question was the same for all participants, we randomly assigned participants to three different treatment groups. The “expert group” was told that prestigious economist James Heckman had shown that spending at early ages was more efficient at increasing student’s skills. The “normative group” was told that institutions had the responsibility to ensure kids developed their skills. The “emotional group” was shown a picture of a young girl and were told that she would benefit from the policy as currently she could not attend nursery. Lastly, the “control group” was asked the policy question directly. Comparing the levels of support for the policy of each of the treatments to the control group allows us to isolate the specific effects of providing respondents with different cues. As results in Figure 1 illustrate, all else being equal, the support for the policy is significantly larger for those in the “expert group”. Likewise, those in the “emotional group” specified a greater support for the policy. This was not the case for the “normative group”, where no significant difference was found. Moreover, we find no significant difference in the effects of the emotional and the expert treatments. Figure 1. Marginal Effects of Treatments. While being presented with cues from an expert appeared to influence respondent’s level of support for the policy in average, it did not necessarily affect all subgroups of the sample population equally. Motivated by the fact that education has been often pointed out as strong predictor of vote for parties or political options that embrace post-truth politics, we also tested the effect of the treatments depending on the level of education. As Figure 2 shows, education does indeed play a role in determining the impact of the expert treatment. Expert cues increase support towards the policy for respondents with medium and high education. However, the treatment those in the low education group do not seem to be affected by the expert cue. 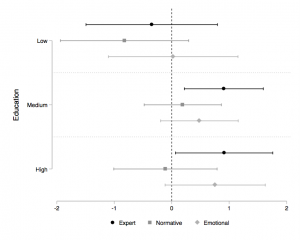 To wrap up, we find that both experts’ cues and emotional cues increase the support of a given policy but there is no evidence of citizens responding more to emotions than to experts and evidence. 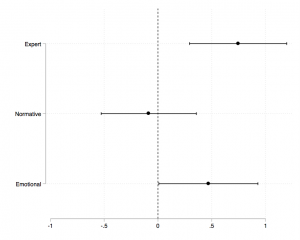 It is true that individuals with lower education seem to respond less to the expert’s advice, a similar finding when looking at the groups overrepresented in the Brexit or Trump vote. However, they also seem to respond less to the emotional treatment too, albeit the difference is not significant in that case. Further research should try to check if these dynamics are sustained in other settings and with other policies. So far, the ironic implication of this finding is that the growing concern that citizens ignore facts presented by experts does not seem to be based on facts. Berta Barbet is a Postdoctoral fellow at the Department of Political Science at the Universitat Autònoma de Barcelona. Antoni-Italo de Moragas is a Ph.D. Researcher in the Department of Economics at the European University Institute. Guillem Vidal is a Ph.D. Researcher in the Department of Social and Political Sciences at the European University Institute. Graetz, M. J., & Shapiro, I. (2005). Death by a thousand cuts: The fight over taxing inherited wealth. Princeton: Princeton University Press. Katwala, S., Ballinger, S., & Rhodes, Vm. (2015). How to talk about immigration. London. See appendix for concrete wording of the treatments.